NASA's Genesis spacecraft was successfully launched on its three-year, 20-million mile voyage by a Boeing Delta 2 rocket today, kicking off the $260 million mission that aims to catch particles streaming from the Sun and return them to scientists on Earth. Running more than a week late because of a technical concern with parts on the satellite and bad weather, today's countdown was virtually trouble-free, culminating with ignition of the rocket's liquid-fueled main engine and three strap-on solid rocket motors for liftoff at 12:13:40 p.m. EDT (1613:40 GMT). 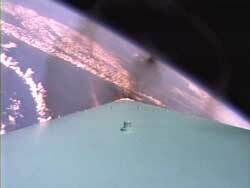 As the rocket thundered away from pad 17A at Cape Canaveral Air Force Station, Florida, a video camera mounted to the second stage captured dazzling views of launch that's becoming a trademark of Delta missions for NASA. 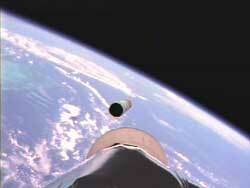 The "rocketcam" was built by CrossLink Inc. of Longmont, Colorado. 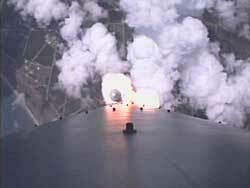 The video system is designed for use by Delta, Atlas and Titan rockets and the space shuttle. 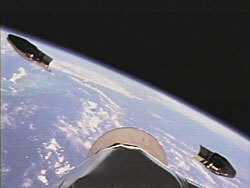 Some 64 minutes after liftoff, while soaring high above Australia, Genesis was deployed from the rocket's third stage, setting sail for a spot a million miles from home in search of the answer to one of the most basic, yet important, space science questions: what is the matter that formed the solar system made of? If all goes as planned, Genesis will return to Earth in September 2004 with the first samples ever collected of the solar wind, material that will help scientists determine what was in the cloud of gas and dust from which the solar system formed 4.5 billion years ago. "This mission will be the Rosetta Stone of planetary science data, because it will show us the foundation by which we can judge how our solar system evolved," said Chester Sasaki, Genesis project manager. "The samples that Genesis returns will show us the composition of the original solar nebula that formed the planets, asteroids, comets and the Sun we know today." According to current models, the solar system formed when a massive cloud of gas and dust collapsed under its own gravity. Most of this mass went into what became the Sun, while other gravitational disturbances in the collapsing nebula led to the formation of smaller bodies that eventually became planets, moons, asteroids, and comets. For years, scientists have sought to determine the composition of that original nebula and compare it to the composition of other solar system bodies to see how those bodies have evolved over time. The best way to do this is to study the composition of the Sun which, given its huge mass, is the body most likely to have retained its original composition. Scientists have already determined the Sun's composition to some by looking for the unique spectral signatures of elements embedded in sunlight. However, even the best spectroscopic observations do not provide planetary scientists with the precision they need to compare the Sun's composition with that of other solar system bodies. To accomplish this scientists need actual samples of the Sun they can study in the lab. While a mission to the Sun itself to obtain samples is not technically feasible, there is a far easier and less expensive alternative. The Sun emits a steady stream of particles known as the solar wind, made of material from the Sun's upper atmosphere. By collecting samples of the solar wind, one is essentially capturing the same material that made up the protosolar nebula. To accomplish this, Genesis will fly to the Earth-Sun L1 Lagrange point, about 1.5 million kilometers (1 million miles) sunward of the Earth. This location, a common place for stationing spacecraft that study the Sun, is also free of the Earth's magnetic field, allowing Genesis to study the solar wind without interference. 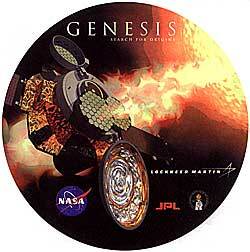 Genesis will spend about two and a half years there, completing five wide, looping halo orbits of L1. While there, the spacecraft will deploy several collectors designed to capture particles entrained in the solar wind. Different collectors will be used depending on whether the solar wind is fast or slow, or if a coronal mass ejection -- a type of solar storm -- is taking place. Ion and electron detectors on the spacecraft will categorize the nature of the solar wind and determine what collector arrays should be deployed at a given time. In addition to the collector arrays, Genesis also carries a solar wind concentrator. This concentrator is designed to increase the concentration of oxygen and nitrogen ions collected by the spacecraft. Oxygen is of particular interest to scientists because they have measured different ratios of the most common oxygen isotope, O16, to two heavier versions, O17 and O18, on different solar system bodies, but do not know what the original oxygen isotope ratios were in the protosolar nebula. 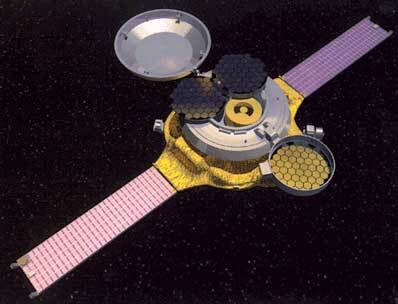 After completing its collection of the solar wind, Genesis will leave its L1 halo orbit in April 2004. The spacecraft will perform a distant flyby of the Earth and then circle the Earth-Sun L2 point, behind the Earth, to set up for a daytime reentry over the western U.S. in September. 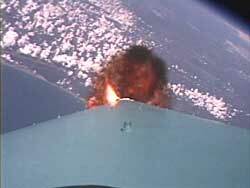 While the rest of the spacecraft burns up over the eastern Pacific Ocean, a small return canister will survive the reentry and descend to Earth by parachute over a military training range near Salt Lake City, Utah. Before landing, though, the capsule will be captured in midair by helicopter so that the impact of landing does not damage the solar wind samples. Once on Earth, the samples will be taken to a special facility at NASA's Johnson Space Center, where scientists will study them with advanced laboratory equipment to determine their composition and draw conclusions about what was in the protosolar nebula. Scientists have high hopes that the solar wind returned by Genesis will help them resolve some key mysteries about the solar system. "Genesis will return a small but precious amount of data crucial to our knowledge of the Sun and the formation of our solar system," said Donald Burnett, principal investigator of Genesis. "Data from Genesis will provide critical pieces for theories about the birth of the Sun and planets." Today's launch marked the 287th for a Delta rocket dating back to 1960 and the 271st successful flight. 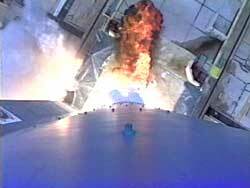 For the Delta 2 vehicle, it was the 98th launch since 1989 and 96th success, extending the workhorse rocket's consecutive successful string to 43 since 1997. September 15: Dual launch of NASA's TIMED atmospheric research satellite and the French/U.S. Jason-1 oceanography craft. 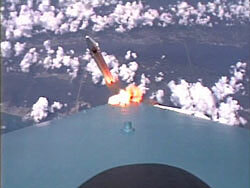 October 18: Launch of the commercial QuickBird-2 Earth-imaging satellite. December 20: Launch of NASA's Aqua Earth Observing System spacecraft.